Bremen (1858), North German Lloyd. Build by Caird & Co., Greenock, Scotland. Tonnage: 2,551. Dimensions: 321' x 39'. Single-screw, 10 1/2 knots. Inverted engines. Three masts and one funnel. Iron hull. Clipper bow. Passengers: 150 cabin, 800 third. Note: Pineer steamship of the North German Lloyd. 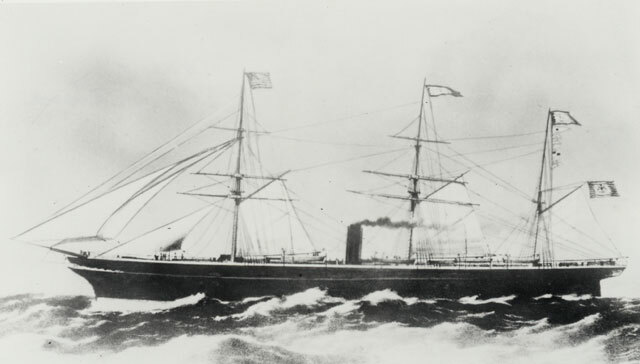 Madin voyage: Bremen-NewYork, June 19, 1858. Made her last voyage for line in November 1873. sold to British shipowners in 1874 and converted to sail. Wrecked of San Francisco in 1882. Running mates: New York (identical), Hudson and Weser. From Passenger Ships of the World Past and Present by Eugene W. Smith, copy of ships information provided by The Steamship Historical Society of America.